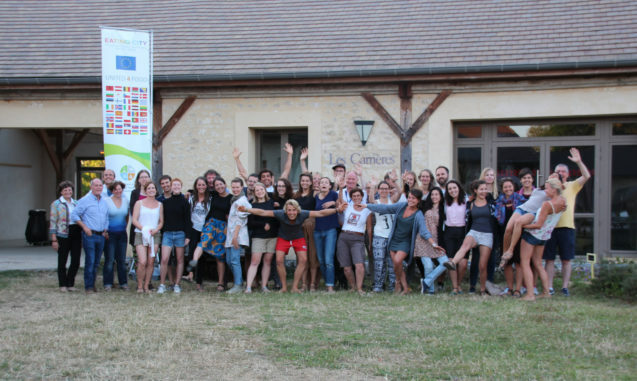 During one week, 23 young participants have met, discussed and put their energy and creativity in this text which is the 4th Villarceaux Declaration. Discover their straightforward recipe to implement the change of paradigm for sustainable food systems. We are young professionals from 20 different European countries with different backgrounds and realities. We spent seven days discussing, sharing and confronting arguments and experiences about food. Together, we acknowledge that our current food system is in deep crisis. There is an immediate need for a paradigm shift. In line with the Eating City platform, the Eating City Summer Campus 2016 acknowledges that the City is at the centre of the problem – and the solution. The Public Food Service presents a transformative opportunity to affect positive change. This is why our united message is addressed to the cities, in particular to the municipal decision-makers. Nevertheless, we acknowledge the fact that each layer of governance has its duties and responsibilities, from the EU to the local level. The crisis we face today is a complex one. Currently, humans control Nature for their own benefit disregarding its agroecological resilience. We as the human race have forgotten that we are part of a bigger picture and that we are interdependent. This extractive model is no longer viable to ensure the future of the planet and human kind. The dominant claim to keep producing more food to feed the world is only making the problem grow bigger. Hunger, obesity, non-communicable diseases, waste, processed food, ignorance, exclusion, inequality. This is on the menu. Right to food, food sovereignty, social inclusion, pleasure, flavour, cultural recognition, linking the urban and the rural. This is what we want. In order to make our food cycle sustainable, we have identified two different and interconnected sets of actions. On the one hand, a new facilitating governance framework for food is necessary. On the other, we have to transform each step of the cycle from production through consumption to waste – and back to the land again. Problem: There is a lack of political willingness and/or capacity to deal with sustainability issues and with food issues in particular. Consequently, cities’ actions are often fragmented and rely on personal motivation of individual City officials. Solution: Fostering interdepartmental and cross-sectoral coordination will enable an integrated vision and positive synergies in cities sustainable food policies. impact on public health and environment. Solution: Resilient and sustainable Public Food Service offers an immense opportunity to shift consumption patterns and ensure social inclusion. Problem: Cities do not facilitate community engagement with sustainable food issues or the integration of these challenges into public education. Solution: Investing in food knowledge and education will stimulate public awareness and encourage participatory food governance. Problem: Inhabitants are disconnected from their food physically and conceptually. On the other hand, small to medium scale food producers lack the capacity to market access. Solution: Activating and linking the physical, social and professional space for food will facilitate the shortening of food chains between consumers and producers, and encourage building relationships toward achieving sustainable food practices. Problem: Food waste is regarded as an inevitable byproduct of an “efficient” food system tilted towards consumer responsibility. So far, the response has been reactive rather than preventive and city action has been fragmented. Responsibilities are not being distributed throughout the chain. Solution: Waste management should be considered from pre-production through post-consumption. Cities should assess services and infrastructure in order to promote integrated actions.